Thus, for instance, a June 18 concert at Orchestra Hall that had the DSO playing Bernard Herrmann's nightmarish score for Psycho. As a wildly mixed audience of T-shirted kids, goateed hipsters and larking baby boomers watched Janet Leigh's shower scene, the orchestra's string section provided the movie's signature series of jagged shrieks with a way-better-than-Dolby vividness. Or take Classical Roots, a program celebrating the work of African-American composers, which occupies a central position on the orchestra's calendar. And despite the DSO's financial troubles, its commitment to its 700-member Civic Youth Ensemble program has not flagged. But concerts like the one at the Matrix Center are more indicative of where Slatkin and Parsons want to take the orchestra  to those new audiences that, they hope, will come to see that a symphony orchestra is worth not just saving but cultivating. "It's kind of a delivery van," says Slatkin, whose musicians have played everywhere from high school auditoriums in blue collar suburbs to a Salvation Army rehab center on the city's southwest side. Slatkin was similarly adventurous when he was music director of the St. Louis Symphony in the 1980s, but in Detroit, adventure has become necessity. Slatkin also imagines a musical future in which the very role of a musician is redefined. "My job," he says, "is to increase the orchestra's revenue." He suggests that the ability and willingness to promote the orchestra and its music might someday be part of the hiring process for musicians. He even wants to offer public-speaking classes to orchestra members. Among other things, public relations in Detroit means contending with the city's enduring predicament: race relations. 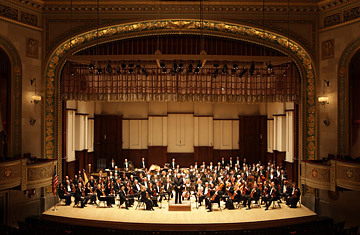 In a city whose population is 90% African American, only three of the DSO's musicians are black. Rick Robinson, an African-American double bassist who grew up in the inner-city enclave of Highland Park, calls it "the elephant in the room"  the dilemma of nurturing and promoting what remains a largely white art form. When Robinson joined the DSO in 1989 and refused to attribute its overwhelmingly white complexion to racism, then mayor Coleman Young cruelly called him an Uncle Tom. But Robinson, whose own compositions meld classical, jazz and blues idioms, perseveres. He sees music as a potential healer in a region disfigured by racially inflicted scars. Promoting classical music, he says, can help him become "a pillar on the bridge between black and white"  a bridge he believes is necessary to his city's very survival. From "Keep Away" to "Come On In"
Many people in Michigan argue that when a city's school system has collapsed, you can hardly make the case that public money should be spent on an orchestra. Advocates for public subsidies must also contend with the free-market argument that inevitably attaches itself to debates about government support of cultural activities. "Art subsidies rob Peter to pay Paul," says Michael D. LaFaive at the Mackinac Center for Public Policy in Midland, Mich. "Who is to say your favorite art is more worthy of my tax dollars than my favorite art?" Pro-funding advocates say high culture is a necessary municipal benefit, providing jobs and luring talented professionals. Parsons (who, like Slatkin and the rest of the DSO staff, took a salary cut in the recent budget cutting) argues that "a healthy symphony orchestra makes businesses and people want to live in a city." Another way of putting it: losing its symphony orchestra would be a sure indicator of a city's decline, a signpost reading "Keep away." Essentially, it's an economic argument, which is the kind that resonates most compellingly in Michigan these days. John Bracey, who directs the state arts council, will be handing out just $1.3 million in state money to cultural institutions this year, compared with $25 million 10 years ago. "We understand the value of a spot welder in an auto factory, but it's difficult to get policymakers to understand the value of a soundman for a symphony orchestra," Bracey says. "His job is just as important to his family  and to the state's economy." And, arts advocates maintain, it makes the state a better, more harmonious place to live.